QUOTE: "Hero. What do they know? I don't wear this mask to save their children." Richard Booker's life was changed forever after he found his father lying in a pool of blood on a Friday afternoon. Earlier that day, Richard Booker had played in an important college football game that had been rigged by small-time bet fixer, Marcel Larcone. Booker had been instructed to fumble, but scored the winning goal-- not realizing the harsh penalties his action would incur. To punish Booker's failure, Larcone plotted an attack on Richard's father, Claud Booker. Claud survived the attack, but was left severely brain damaged. After trying several disappointing roads to redemption, Richard Booker's guilt over his father's fate lead him down a new road... to revenge. Richard Booker's journeys have taken him from basic training to a covert army special forces team. Before being discharged from the service, Booker gained skills including: survival training, close quarter combat, long range weaponry, piloting assorted aircrafts, paratrooper training, and reconnaissance. 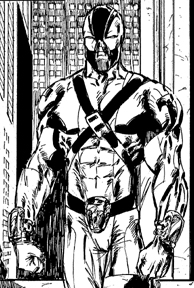 Not long after becoming the Torpedo, Booker received a briefcase containing a prototype T.E.C. personal flight suit. With the T.E.C. suit jets, Torpedo can fly for a limited time, up to 400 mph (emergency speed). And the wrist-mounted plasma blaster serves as a powerful weapon that can tear through almost any substance from living flesh to solid steel. By day, Booker works in a run-down pawn shop, often seeking time-off work from his boss, Christian. 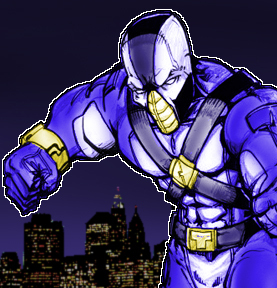 Torpedo continues to prowl the streets at night for muggers and thugs-- not to rid the streets of crime, but to beat information out of them. So far, he hasn't learned the whereabouts of Marcel Larcone, but Richard Booker is a man possessed. He will stop at nothing to destroy the man responsible for Claud Booker's assault. 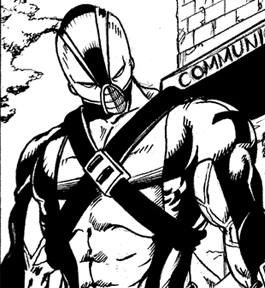 If and when Torpedo gets to Larcone... Torpedo will prove himself no hero.